It has been the 24 hours from hell for the former Minister for Justice. FORMER MINISTER FOR Justice (and current Minister for Business, Enterprise, and Innovation), Tánaiste Frances Fitzgerald is in a tough spot this morning. The fallout continues apace from the disclosure yesterday that Fitzgerald knew about the Garda Commissioner’s instructions to her legal counsel to attempt to call into question the integrity of Sergeant Maurice McCabe a year earlier than she said she did, with opposition politicians calling for her to give ‘greater clarity’ over what she knew or didn’t know. It’s not the first time Fitzgerald has been through the wringer over the McCabe saga – last February she, then Taoiseach Enda Kenny, and Children’s Minister Katherine Zappone were at the centre of yet another scandal, which related on that occasion to the scandal involving child agency Tusla and a series of allegations against McCabe. 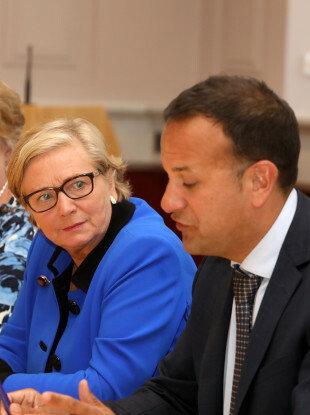 But this situation may prove more difficult to survive, not least because Fitzgerald’s Dáil session from hell also saw new Taoiseach Leo Varadkar also drawn into the mire. So, is it time for Fitzgerald to go? We’re asking: Should Frances Fitzgerald resign over the ‘forgotten’ McCabe email? Email “Poll: Should Frances Fitzgerald resign over the 'forgotten' McCabe email?”. Feedback on “Poll: Should Frances Fitzgerald resign over the 'forgotten' McCabe email?”.